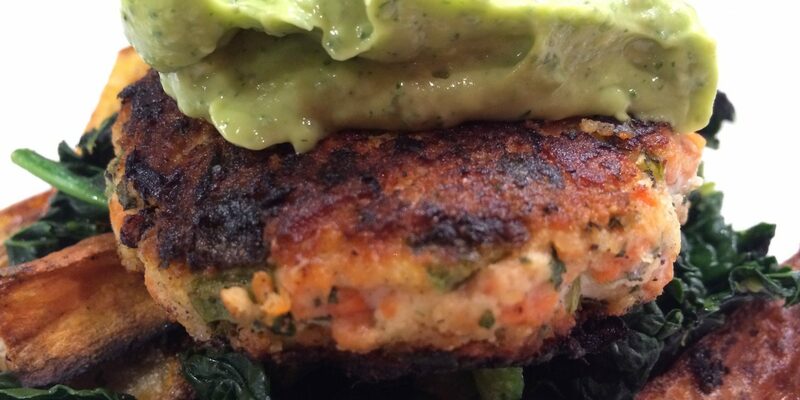 This month Recipe Redux challenged us to recreate the “pattie,” into a healthy, but satisfying experience in honor of St. Patty’s Day. Worthy of a facelift, let’s give patties a fighting chance. So, turkey is out, right? Is anyone besides me sick of eating 98 difference recipes for healthier turkey burgers? Maybe I’m the only one who has killed that one. I strongly considered bison or buffalo. Love both, and they are super lean and low in cholesterol, with tons of flavor. So similar to a beef experience. But holy cow (no pun intended), so expensive. I landed on salmon. One of my favorite fish. I used frozen, to bring the cost down. The irony, however, frozen sockeye is pricey! So, feel free to use a cheaper frozen salmon if the sockeye blows your budget. The sockeye, though…even frozen, it stayed tender and moist, rich in color. Deep in flavor, but not fishy at all. The bottom line? This pattie facelift resulted with a lemon herb salmon burger that my husband requested be added to the weekly dinner menu rotation. We both loved them. They didn’t have a prayer of lasting longer than 1-2 days. So, thank you Recipe Redux. You inspired a tasty recreation! If you are familiar with my “free food” recipes, you know I work with dairy-free, egg-free, gluten-free, sugar-free ingredients. But many of my recipes give options for those who aren’t because many of these ingredients have simple swaps. I’ve included notes about these swaps in the recipe below. If you want to use an egg as the binder in your salmon burger, go for it. OR you can use the ground chia of flax seed/water mixture I give you in the recipe. Dairy-free/egg-free mayonnaise and sour creams are 1:1 swaps for dairy ones, so use what suits you. Know you have options and can make this recipe work for you. I use Spectrum Egg-free, Dairy-free Mayo or Earth Balance Dairy-free Olive Oil based for mayo. I live Vegan Gourmet for dairy-free, vegan sour cream. 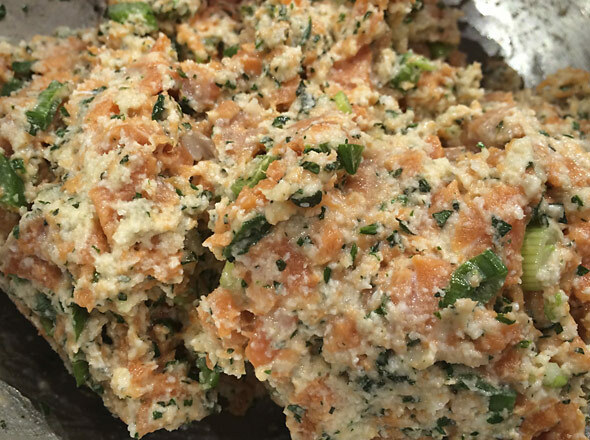 Gluten-free or wheat breadcrumbs will work to tighten your salmon burger mixture. OR you can use a grain-free (and gluten-free) nut meal. I prefer almond flour (raw, blanched, finely ground almonds, Honeyville brand), or even ground pepitas. Let’s Make Lemon Herb Salmon Burgers with Avocado Aioli! Once defrosted, skin salmon and dice into 1/4" pieces (small dice). Grind chias and put them into water. You can use 1 TBS flax seeds in 3 TBS water for 1/2 TBS chias OR 1 egg. Wash and dry all veggies and herbs. Dice jalapeño (for the burger and aioli). Use as much to your taste. I used 1/2 in the burger and didn't find the burger spicy, but I used more in the Avocado Aioli for added spice. In a medium sized mixing bowl, add diced salmon, ground chia and water mixture, fresh lemon juice, green onions, minced herbs, diced jalapeño, grated garlic, sour cream, and coarse salt. Stir together well, but gently. Once incorporated add breadcrumbs, nutmeal, or ground pepitas. Start with 1/2 cup, add 2 TBS more, if needed. The mixture should come together so you can form a pattie. Form into uniform size patties (I use a scale to weigh mine, making 3-4 ounce patties so they are easy to flip), setting on wax paper so they will be easy to remove and place in the pan when you are ready to cook them. You can mix these yummy burgers in advance and let sit in the fridge. The longer you let the flavors meld together, the more flavorful your burgers will be. Put all aioli ingredients into the food processor and blend until smooth and creamy. Add as much or as little jalapeño as suits your spice preference. You can use all mayo or all sour cream if you prefer. I like the balance of the two. I eat dairy-free, so I use all the vegan/dairy-free versions of mayo and sour cream, but this recipe works great with the dairy versions of these foods. Over medium high heat in a non-stick, iron, or green pan skillet, add a small amount of coconut or grape seed oil to coat the bottom of the pan. Add your salmon burgers to your hot pan. Let the first side sear, getting a golden crust and setting the burger. This will take about 4 minutes, depending on the size of your burger and how high your heat is. Once you have a golden crust and your burger is set (the sides will start to change color, getting white), flip and sear the second side. This side should not need to cook as long as the first side, another 2-3 minutes. 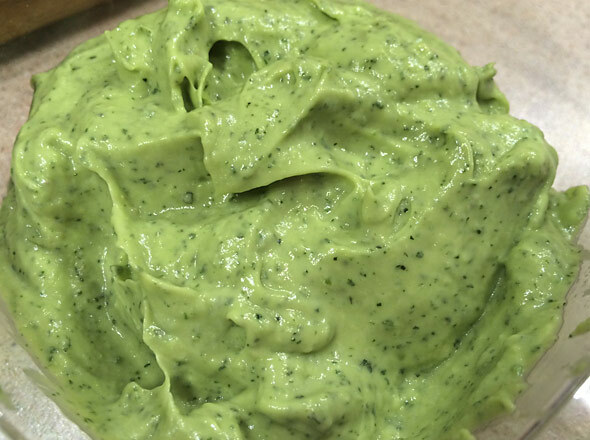 Once cooked, remove from pan and top with avocado aioli, You can serve on a bun, on top of a salad, or veggies. I ate mine on top of baked sweet and white sea salt fries tossed with kale. Delish! Makes 4-6 burgers, depending on size. Aioli makes about 1 1/4 - 1 1/3 cups. 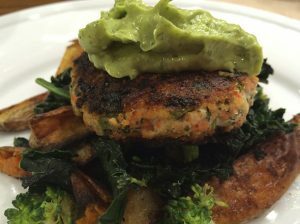 I served my Lemon Herb Salmon Burger with Avocado Aioli on top of Baked Sweet and White Sea Salt Fries tossed with Kale and Broccoli. My family loves salmon burgers. Keeping this for future menu planning. I hope they love it as much as we do, Jill. Cheers!